As the weather heats up and the layers peel off, many of us quake in fear of the horrors that may lie beneath! It’s also a time when those that are that way inclined get self tanning, and dry, dull winter skin does not a great fake bake make. The answer lies in exfoliating and moisturising, and there are an insane amount of products out there on the market claiming to be amongst the best at doing both. One that I have found that does a great job and then some of the former is Dermalogica’s Exfoliating Body Scrub. 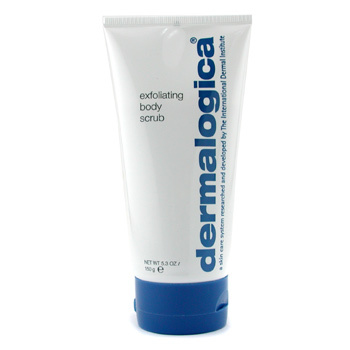 Designed for all skin conditions, it's a creamy, lightly foaming body scrub that really does dramatically smooth, polish and energise sluggish skin. It uses pulverized Fig, Date and Olive seed powders to gently remove dead and dulling cells without stripping the skin, whilst Rice Bran and Papaya Enzymes slough off impurities and stimulate cell renewal. Add to that purifying essential oils of Lavender, Orange, Sandalwood and Rosemary to condition and invigorate the body while smelling seriously yummy, and you have a truly killer product.